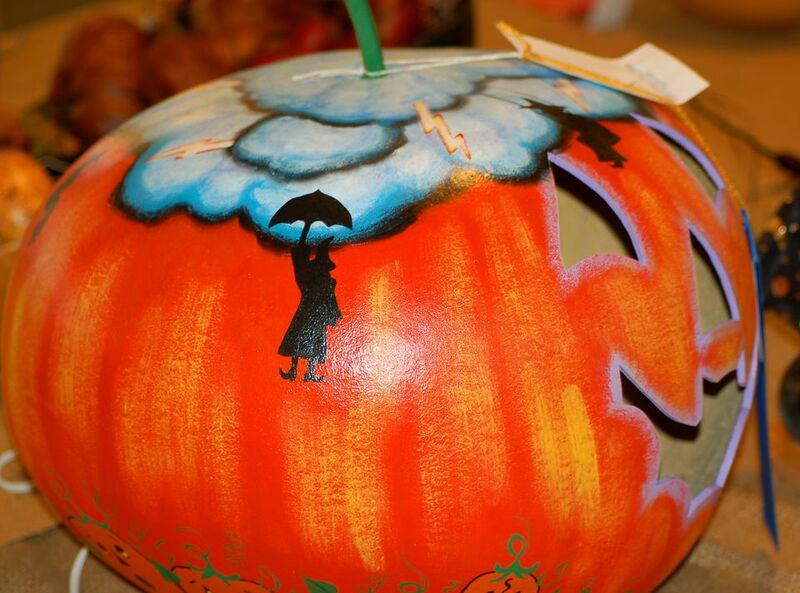 Pumpkin festivals are a terrific source for pumpkin carving ideas. These pictures were taken at the old Keene Pumpkin Festival in New Hampshire (U.S.). Each year, the city of Keene tried to break the world record for most carved pumpkins assembled in one spot (it held the record several times, most recently in 2013). Creative people from miles around brought their carved pumpkins to the festival, hoping to be a part of history. If you attend such festivals, all you have to do is keep your eyes open to acquire a multitude of creative ideas. The pictures below represent just a small sampling -- some of jack-o'-lanterns viewers most enjoyed at this particular festival. This is just one part of a series on pumpkin carving ideas that you can consult. Do you feel the need to go beyond carving the traditional jack-o'-lantern face on your Halloween pumpkin? 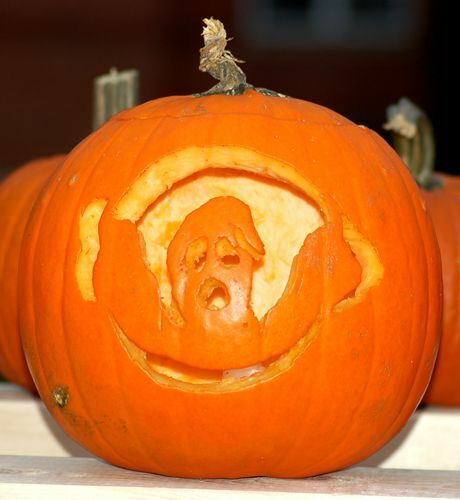 Here's a pumpkin carving idea: Carve one of the iconic Halloween figures on your pumpkin, instead. The carved pumpkin picture above shows an example; what bigger Halloween icon is there than the ghost? In the next three pictures, we will see pumpkins on which other famous Halloween symbols are used. In the prior picture, the Halloween icon used in the pumpkin carving was a ghost. But the Halloween cat is right up there with the ghost as an elite symbol of Halloween. In the next picture, we'll look at another example of a Halloween icon carved on a pumpkin, in lieu of the standard jack-o'-lantern face. From a ghost to a black cat to another Halloween icon. Frankenstein is a natural to replace ol' Jack on a Halloween pumpkin. The Phantom of the Opera could be considered a "second-tier" Halloween icon. Not as popular as ghosts, black cats or Frankenstein, the Phantom of the Opera is still plenty appropriate for Halloween. In the next few pictures we'll be looking at jack-o'-lanterns whose mouths are their prominent feature. The handsome fellow in the photo above has quite the set of teeth. Another jack-o'-lantern with a big mouth. But this pumpkin face seems to be laughing more so than smiling. This pumpkin has "smiley face" written all over it. Except that the smile is crooked -- as you would expect for Halloween. The next three pictures provide pumpkin carving ideas that focus on prominent tongues. In the picture above, the tongue comes from the flesh cut out for an eye or nose hole. The rest of the face is carved to be white (using a Dremel tool, probably), making the orange tongue stand out all the more. Pumpkins That Are "All Tongue"
Looking at this big-tongued jack-o'-lantern, it is hard not to think that it is supposed to be a Mick Jagger pumpkin. Here, the method for forming the tongue is the reverse from that in the prior picture. In this photo, it is the tongue that is carved white, using a Dremel or similar carving tool. The tongue on this funny pumpkin face is created via a more typical approach. The flesh around it is merely carved out, leaving a tongue. The face in a pumpkin carving need not be head-on. This picture shows a nicely carved profile of a woman. This pumpkin could be said to have been carved "inside-out." That is, the flesh in the eye, nose and mouth areas is left untouched. It is the flesh across the rest of the face that is carved away (with a Dremel or similar tool). In earlier photos, we saw examples of pumpkin heads carved in such a way as to accentuate the mouth. Here, however, the carving accentuates the eye area. This pumpkin head seems to have "thinking" wrinkles around his eyes, as if thinking really hard on some matter. The classic jack-o'-lantern is clean-shaven. But this pumpkin head decided to be different and sport facial hair. Snowmen are often designed as pipe smokers. So why not pumpkin heads? A "pipe" is readily available: the pumpkin's stem, after it has been cut off from the top of the pumpkin. OK, You Grew a Gourd; Now What Do You Do With It?